The silent half of Penn & Teller went to great lengths to pursue a Belgian entertainer who posted a copycat illusion on YouTube, and the case resulted in an entertaining ruling. Teller is widely known as a great magician, but he has just pulled off a feat that is without equal among his peers. He has prevailed in a lawsuit against another magician who put up a copycat illusion on YouTube. Technically speaking, magic tricks aren't copyrightable. In a ruling by a Nevada federal court on Thursday, U.S. District Judge James Mahan states that explicitly. What is protectable under copyright law is pantomimes, the art of conveying emotions, actions and feelings by gestures. The theatrical medium where magicians work has some of the flavor of pantomimes, and Teller has used it to his advantage. "Shadows essentially consists of a spotlight trained on a bud vase containing a rose. The light falls in a such a manner that the shadow of the real rose is projected onto a white screen positioned some distance behind it. 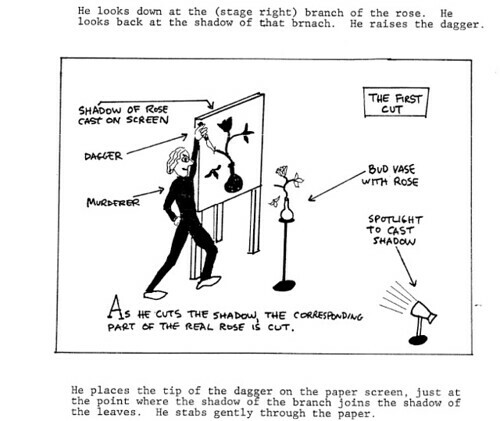 Teller then enters the otherwise still scene with a large knife and proceeds to use the knife to dramatically sever the leaves and petals of the rose's shadow on the screen slowly, one-by-one, whereupon the corresponding leaves of the real rose sitting in the vase fall to the ground, breaking from the stem at exactly the point where Teller cut the shadow projected on the screen behind it." Teller has been performing this trick for nearly four decades. Judge Mahan says there is substantial evidence that he is the creator. It's been an important part of his act and has had some mystique. Teller's partner, Penn Jillette, has publicly stated, "No one knows how Shadows is done, and no one will ever figure it out." Belgian entertainer Gerard Dogge posted a YouTube video of an illusion called The Rose & Her Shadow and offered to reveal the secrets for $3,050. The caption on his video said, "I've seen the great Penn & Teller performing a similar trick, and now I'm very happy to share my version in a different and more impossible way for you." That's what led to the lawsuit, and before it got to summary judgment ruling this week, Teller went to lengths to punish Dogge for copyright infringement. Literally. Teller had to hire a private investigator to locate Dogge to serve papers to him, and for a while, Dogge evaded service in Belgium, Spain and other European countries. So Teller did a neat new trick. He emailed the court papers to Dogge and managed to convince the judge that his imitator had opened them. It was enough for the judge to allow the lawsuit to proceed. Finally, Dogge put up a defense. The defendant challenged the validity of the registration as a pantomime drama, but the judge waives such objection off. "While Dogge is correct that magic tricks are not copyrightable, this does not mean that Shadows is not subject to copyright protection," writes Judge Mahan in his ruling. "Indeed, federal law directly holds 'dramatic works' as well as 'pantomimes' are subject to copyright protection, granting owners exclusive public performance rights. The mere fact that a dramatic work or pantomime includes a magic trick, or even that a particular illusion is its central feature does not render it devoid of copyright protection." Dogge next tried to argue that in Jillette's pronouncement that "no one will ever figure it out," the statement was a challenge and an invitation for others to copy. But the judge reads what Jillette had to say carefully. "This statement merely provokes others to unearth the secret, not perform the work." Among the other arguments was Dogge's insistence that his own trick wasn't substantially similar. The two versions both featured roses, screen projections and cut parts. Dogge, though, attempted to explain that his "secret to performing the illusion" differed from Teller's. This defense incites Judge Mahan to offer an incredible rebuttal. "By arguing that the secret to his illusion is different than Teller's, Dogge implicitly argues about aspects of the performance that are not perceivable by the audience," he writes. "In discerning substantial similarity, the court compares only the observable elements of the works in question. Therefore, whether Dogge uses Teller's method, a technique known only by various holy men of the Himalayas, or even real magic is irrelevant, as the performances appear identical to an ordinary observer." The case now likely goes to trial on the question of what damages are to be awarded because the judge finds that Dogge has raised a genuine dispute of material fact whether he willfully infringed upon Teller's copyright. If a jury finds Dogge's misappropriation to be willful, Teller will be entitled to up to $150,000 in statutory damages. If not willful, Teller might get up to $30,000. Besides copyright, Teller also has an unfair competition claim, and the judge is throwing this to a jury as well to determine whether Dogge's YouTube videos were likely to cause confusion as to Teller's involvement with Dogge's commercial activity. Teller is not the first magician to sue. See, for example, Robert Rice, aka The Mystery Magician, who sued Fox over its Breaking the Magician's Code specials, and wound up coming up short. Teller isn't the first magician to win one of these lawsuits either. See David Copperfield's lawsuit against a French magician who copied his flying routine. That case was in France, though. Time will tell if other magicians attempt to follow in Teller's tracks in United States courtrooms. As the judge notes in the opinion, "Though there are organizations, taken seriously by many in the magic community, that blackball any performer who reveals a magician's secret, Teller has opted to pursue this action…"